Dog lovers turn to Banixx to address dog ear infections, dog hot spots and other common ailments. Banixx has been shown to give significant or total relief in all cases. See Case Studies below for real-life studies and check our FAQs for more information. 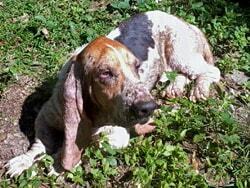 Sunshine had a terrible dog skin infection. 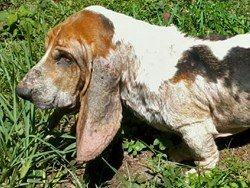 She arrived at SunCoast Bassett Rescue in Florida with a severe case of Demodex all over her body and even into her ears (Demodex is a common infestation of a dog’s skin caused by mites). The dog’s skin irritation was treated with an anti-parasitic to eliminate the mites. 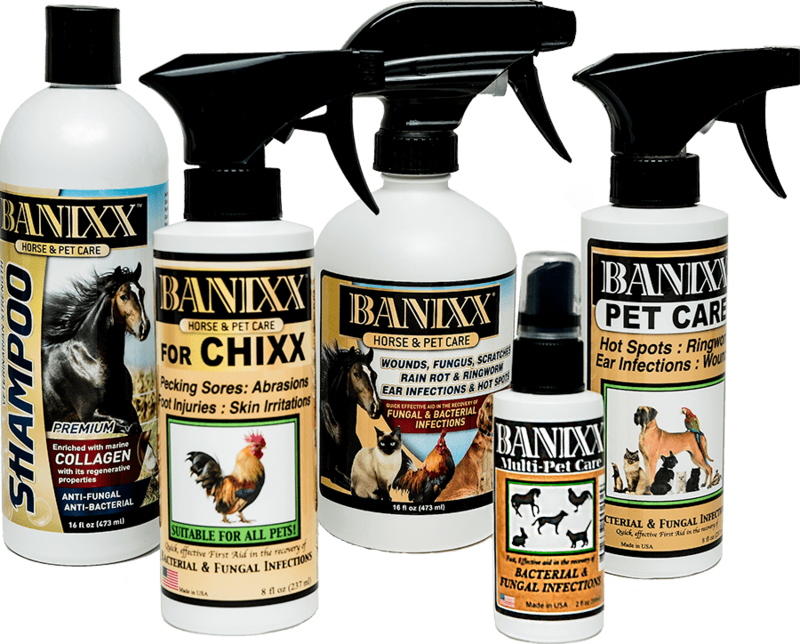 Since Banixx is not an anti-parasitic, it will not kill mites. But, mites create serious skin infections in dogs and this is where Banixx does a great job at clearing up the ravaged skin infections. For Sunshine, Banixx was applied twice daily as a soothing, healing agent for the outward total ear & body skin infection treatment and for her irritated ear yeast infection. 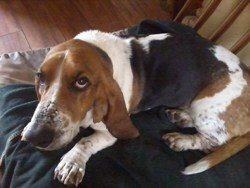 Sunshine made a complete recovery (final picture) and found a forever home. Learn more about treating dog ear infections and ear fungus. 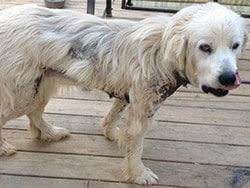 The day Samantha rescued Gwen, the Great Pyrenees from a puppy-mill, the dog was not only suffering from malnourishment and hair loss but also from a horrible skin infection. 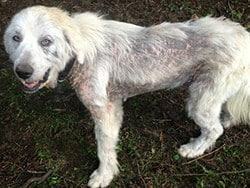 A loving home and good nutrition took care of the first problem, but despite everything Samantha tried, her dog’s skin infection persisted and Gwen’s hair refused to grow. 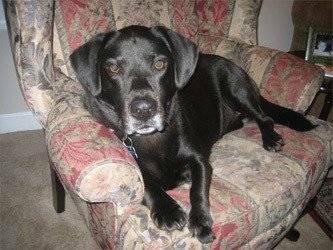 Samantha’s attempts to relieve Gwen’s suffering ranged from various dips and medications to veterinarian-prescribed steroids. Nothing seemed to be capable of eliminating the infection. One day while visiting her local feed store, Samantha came across a bottle of Banixx for Dogs. The label stated that the spray was anti-bacterial as well as anti-fungal. Once Samantha saw how reasonably priced Banixx is, she decided immediately, for Gwen’s sake, to try the product. 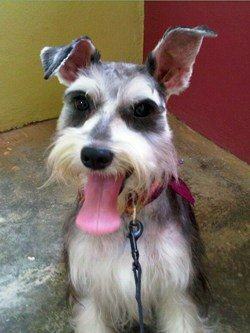 Following the instructions, Samantha sprayed her dog’s skin infection liberally with Banixx twice a day. Banixx’s unscented and safe-to-the-eyes formula made it easy. Soon Gwen’s skin, which was once bright red and irritated, became pink and healthy. And where there were once unsightly bald spots, Gwen’s beautiful coat started to return. Within a few short months, Gwen went from being an unhealthy and very unhappy dog to the energetic, outgoing pet that Samantha always knew was there. Her appalling dog skin infection is now just a bad memory, but Samantha keeps Banixx around the house for her occasional itchy skin, dog ear infections, and hot spots. “Thanks Banixx! I believe we have finally resolved my dog’s itchy ear problem. She was diagnosed with a deformed ear canal & she constantly suffers from an itchy ear. We have tried numerous products including antibiotics from our local vet but nothing seemed to work. After trying your Horse & Pet Care spray we had quick results. Hallelujah! No more ear flapping! !” Michele F.
This is a dog rescue story about Kuma who showed up on a cold rainy evening, weak and thin, looking to be about one year old. 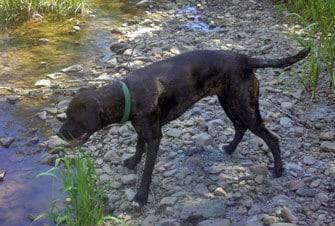 She is a Boxer/Pitbull mix and her tail needed immediate dog wound treatment. The last 10-12 inches of Kuma’s tail was showing nothing but meat and bones, no skin or hair. It was a serious dog tail skin infection. Bone showed through in many places and her tail was badly infected. “After a trip to the vet, where they wanted an unaffordable amount to dock her tail but provided antibiotics, we left a bit discouraged. We just could not afford the procedure nor did we believe she should lose her tail. Timing of learning about Banixx couldn’t have been better! 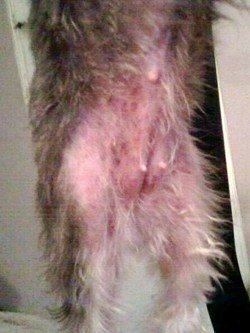 I began spraying Banixx on her tail, twice daily per the directions, leaving it uncovered rather than wrapping it. Sasha presented with an extreme dog skin irritation; she was biting and scratching the area making it raw. Skin yeast infections in dogs and dogs with itchy skin problems are all too common for any breed. Banixx was applied twice daily and her diet changed slightly to include more protein and less grain based foods. 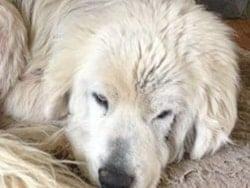 Hitherto these changes, Sasha’s owners had spent hundreds of dollars searching for a cure for their dog’s skin infection. After a couple of weeks of Banixx and a new dog food, costing much less than previous approaches, Sasha was completely cured and back to being a healthy, happy member of the family. Case Study: Puppy Paw – Amputation Diverted! Puck was an 8–week old puppy abandoned at the front door of a local veterinarian office. 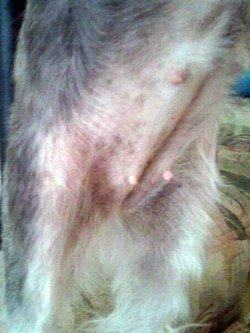 Puck’s left front paw was degloved, completely raw, devoid of all skin and hair. 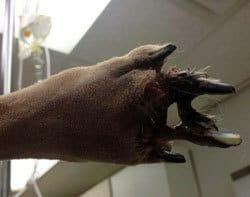 Amputation was considered for this dog. 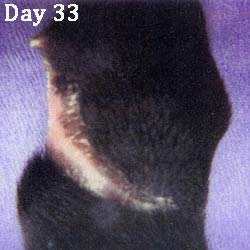 As an alternative, the veterinarian decided to drip Banixx onto the wound daily and protect it with a liquid bandage. Dr. Broadhurst of Pinehurst, NC, the attending veterinarian, said, “as in previous Banixx cases of dogs and cats, the Banixx solution appeared to prevent secondary infection. The rate of closure was so increased in some areas of the wound, that closure was completed by the 10th day”. We’ve seen similar results on a variety of dog wounds and skin infections. By Day 33, there were no more raw areas. By Day 53, Puck was clinically healed. Puck kept his paw and this happy dog was adopted by a loving family. On photo above, you see a healthy, happy Puck. Notice his left front paw. 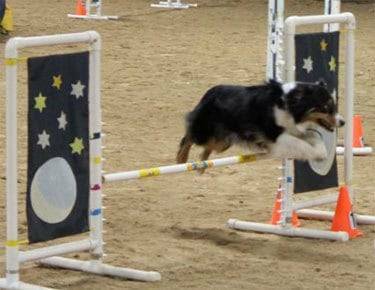 Hailey, an agility dog, was involved in an accident which injured her paw with the chance of losing her paw/leg. The photo above is of Hailey, after a full recovery! Click here to read about Hailey’s full story on our Post Surgical page.